The cost of fertility drugs and fertility treatments such as in vitro fertilization (IVF) can make parenthood seem out of reach to many couples. YouDrugstore is a licensed Canadian pharmacy and can help couples like you order affordable Letrozole tablets. First, speak to your fertility doctor about whether this medication is the best fertility drug for you, then bring your prescription back to us and place your order online or by phoning our customer service hotline. We will send your tablets so you can begin your fertility treatments and be one step closer to a successful pregnancy. It is a generic fertility drug in the form of an oral tablet, with the active ingredient letrozole. This drug is an aromatase inhibitor, helping to reduce estrogen levels to induce follicle growth for ovulation, treating infertility. Doctors usually prescribe Letrozole generic to treat breast cancer in post-menopausal women, and to help keep the breast cancer from returning. However, fertility doctors also use this medication to treat infertility. The drug can help induce follicle growth when women have anovulation, which is a lack of ovulation, from causes such as polycystic ovary syndrome (PCOS), obesity, and other medical problems. Fertility doctors may also prescribe these tablets for ovarian stimulation as part of in vitro fertilization (IVF) treatments, helping to produce more eggs that can be harvested for fertilization. As an aromatase inhibitor, the medication works by inhibiting estrogen production in a woman's body. This medication blocks the action of the aromatase enzyme which normally produces estrogen, limiting its ability to produce the estrogen. Lower estrogen levels in the body trigger the pituitary gland to produce more follicle-stimulating hormone (FSH), which stimulates more follicles to grow, allowing eggs to form that can be released through ovulation. With more eggs released, there is a greater chance that one of them will be fertilized by sperm naturally, or more eggs will be available for harvest at the IVF clinic. Your fertility doctor will give you directions on how and when to take tablets, and you can also refer to your product leaflet. You should take this drug orally, with or without food, usually once daily at about the same time each day. If you miss a dose of Letrozole, take it as soon as possible but if it is almost time for your next dose do not double dose. Your doctor may schedule laboratory tests to monitor your body's response to the drug and to determine any changes in dose. Some bodybuilders take the drug to reduce side effects of anabolic steroids. With extra testosterone in the body from taking these steroids, more testosterone than usual may be converted into estrogen. These high estrogen levels in men can cause negative side effects such as gynecomastia, which is the appearance of breast tissue. Taking these tablets can help lower estrogen levels in men, thus reducing gynecomastia and other steroid side effects. Although it is an off-label use for this aromatase inhibitor, some men use this medication for bodybuilding. These may not be all the possible side effects of this drug. Do not take this medication if you are allergic to it, any of its ingredients, or similar drugs. You can absorb Letrozole dust through your skin and lungs, so do not handle or take tablets if you are pregnant. Tell your doctor if you are breastfeeding. Avoid driving until you know how you react to the drug. This medication is more likely to cause dizziness if combined with alcohol, exercise, fever, or hot weather; sit or stand slowly to prevent dizziness. Do not take tablets with Tamoxifen because it can decrease the drug's effectiveness. Keep the drug out of the reach of children. Your fertility doctor may prescribe this med if your Clomid treatments were unsuccessful, and they may prescribe this fertility drug on its own or in combination with assisted reproductive technology (ART) treatments such as in vitro fertilization (IVF). You may also use a fertility monitor or fertility tests to determine when you are ovulating, and therefore the best time to conceive. Anovulation is a lack of ovulation, which means that a woman's ovaries do not release an egg every month. Ovulation problems like this are generally a symptom of a medical condition such as polycystic ovary syndrome (PCOS) or other problems like obesity, weight loss, diabetes, stress, excessive exercise, or certain prescription drugs. Sometimes anovulation is caused by early menopause, which is when the supply of eggs runs out earlier than normal. Anovulation is one of the most common causes of infertility since if no egg is released, no egg can be fertilized. 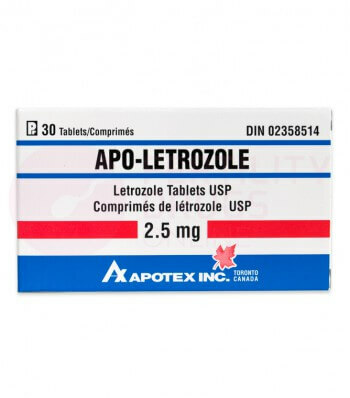 Drugs such as Letrozole can help trigger ovulation in many women with anovulation, helping them to conceive.